Product type(s): Brown, white, pink. Head on, headless, easy peel, peeled, deveined and tail on, peeled to order, IQF, block frozen, fresh. Interesting fact about the business: Pamlico Packing Co., Inc. was one of the original oyster processing plants opened in North Carolina during World War II. A railroad line was built to service the Vandemere waterfront so oysters could be offloaded from schooners directly into boxcars. One of the most famous trawlers at Pamlico Packing Co., Inc. was the “Clara,” which was a World War II “sub chaser” that was later converted to a commercial fishing trawler. Pamlico Packing Company is one of North Carolina’s premier processing operations, as well as a top supplier of specialty seafood products to various markets all along the East Coast. Bountiful harvests of shrimp, flounder and Atlantic Blue Crab are pulled seasonally from the state’s Pamlico Sound, the nation’s largest lagoonal estuary and second in size only to Chesapeake Bay. The business is comprised of two plants: a waterfront property in Vandemere, and another in Grantsboro, which is 12 miles inland. Ed Cross, owner, 82, and his two sons, Don, secretary/treasurer, 50, and Doug, vice president, 52, have owned and operated the plant since 1976. However, the history of the Vandemere facility goes back to 1941 when the Holton family founded the company. Earl Holton ventured into the seafood industry during a time when oysters took center stage. Due to the abundant supply and strong demand, it was a natural fit to open an oyster shucking plant right on the Bay River, which also happen to be one of the original oyster plants opened in North Carolina during World War II. It didn’t take long before loaded down schooners caught wind of the new business and made their way to the company docks. Don says prior to World War II, there wasn’t a dedicated shrimp fishery on the East Coast because the concept of eating shrimp was somewhat of a foreign idea. Fishermen thought they got in the way and locals even called them “bugs.” But, thanks to some entrepreneurial thinking and the national need for more protein sources, Earl helped pioneer the shrimp fishery in the area and went from packing oysters and fish to also packing shrimp. For more than three decades, Earl’s plant thrived year-round from seasonal harvests, but when he was in his late 60s, he started to look for a successor to take over the business. And that’s when Ed came into the picture. Ed always had a love for being on the water, so when it came time to retire from his tile and glass business in Raleigh, North Carolina, he knew exactly what he wanted to do: buy a couple of shrimp boats for recreational purposes and just enjoy life on the Vandemere waterfront with his wife and two boys. He started trawling the Pamlico Sound and made a lot of connections with fishermen, and gained a little wisdom and insight into the industry that was now right in his backyard. Little did he realize how this enjoyable pastime would change his family’s life. One key industry connection he made was with Earl Holton, who Ed says “was a real character.” Unbeknownst to Ed, Earl had been diagnosed with terminal cancer and he was looking for someone to buy the business quickly. Even though Earl knew Ed had no experience in the seafood industry, he felt his strong business background was enough, so the persuasive chats began. Next thing you know, Ed was the owner of a processing plant. Some might say a radical change in career paths is a mid-life crisis, but in Ed’s case, it was nothing more than a mid-life adventure. At 45-years-old, he jumped into a new industry, learned everything he could, and took advantage of the connections he had already made. Earl had two daughters and treated Ed like a son. It wasn’t until a year after Ed bought the plant when he found out his mentor had passed away. One of Earl’s daughters had worked for the company for years and she stayed on to work for Ed, which was a tremendous asset in the learning curve of getting acclimated to a new business environment. Pamlico Packing Company was a fairly small operation under Earl’s direction, and even though Ed started in a new industry late in life, the vision he carried for the business was impressive. He added a crab plant and fish processing room to the original plant and acquired a second plant in 1995 brought substantial growth in size, services and products. At last count, the Cross family has owned 72 different trawlers over the years. The most famous trawler at Pamlico Packing was the “Clara,” a World War II “sub chaser” converted to a commercial fishing vessel. But most importantly, Ed’s risk on a new career provided an invaluable opportunity for a father to pass on a successful seafood legacy to his sons. When Ed moved his family to the North Carolina coast, Don was in fifth grade and Doug was in seventh, so by the time they were in high school, weekends and summers were spent doing things like unloading boats and fishing hundreds of crab pots in the Bay River and the Pamlico Sound. For Doug, it took a little more convincing. After going to college for a year (and “having lots of fun”), he decided to head back home to help his dad, but wasn’t sure what part of the business he wanted to be involved in. One bad experience on the stormy seas solved that problem real quick. Ed is proud of his sons and says the “ungodly hours” they all have put in over the last three decades have made the company what it is today. When it came to shrimp season, it was all hands on deck during the weekends. Pamlico Packing Company is bountifully blessed by Mother Nature’s abundant provision found off the North Carolina coast, but Mother Nature also has tested the company’s resiliency. Since the Cross family has owned the plant, they have been hit by a dozen major storms, but Hurricane Irene in 2011 was the most devastating when a 12- to 14-foot storm surge put the facility out of operation for two years. It forced the corporate offices to be moved to the Grantsboro plant. Under their label, Carolina’s Finest Seafood, a complete line of specialty seafood products — wild caught shrimp, crabs and oysters, as well as international commodities such as flounder, tilapia, catfish, whiting and swai — is available for retail, wholesale, and “all types of restaurants” through the food service industry. A number of grocery stores also carry their full line of fresh, ready-to-eat seafood salads, spreads and dips. 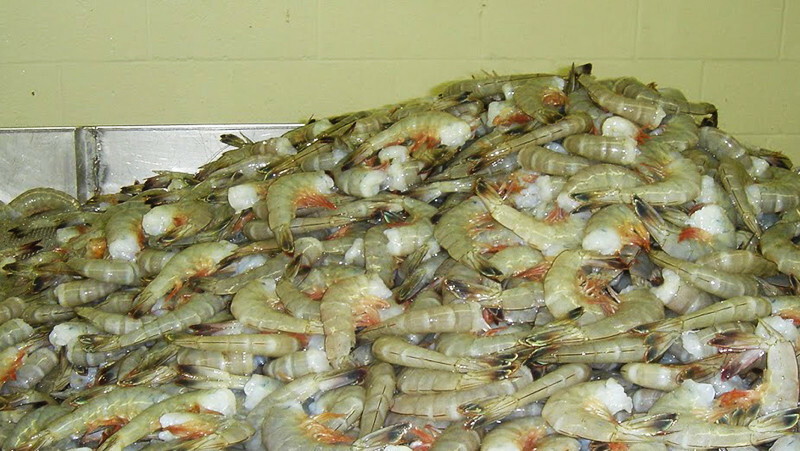 In addition to packing under their label, shrimp can be custom packed under retailer labels. The abundance of brown, white and pink shrimp harvested in North Carolina waters is highly requested from customers (local, regional and national) because of the unique flavor profile that Don says has a “buttery, richer” flavor, and is free of any iodine taste.